Regents was founded by a group of concerned individuals who desired a distinctly different educational opportunity. 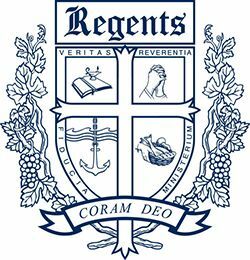 Through diligent prayer, research and commitment to being Christ-centered in principle and classical in method, Regents opened its doors in August 1992. We founded our modest beginnings at Park Hills Baptist Church with 17 students, two classrooms, two teachers, and grades 1-4 in a one-room school-house. Today Regents educates over 1000 students grades K-12 and has become recognized by peers for outstanding accomplishments in teaching, curriculum, students' achievement, parental involvement, and community support. Regents School began at Park Hills Baptist Church with 18 students, two classrooms, two teachers and four grades in rented church space. 131 Students Grades K-8. Moved from Park Hills Baptist Church to Tarrytown Baptist Church. First Graduating Class of Regents - 346 Students K-12. All 477 Students Grades K-12 on the same Campus; 9 Graduates, 11 Alumni. 584 Students Grades K-12 6 Graduates, 26 Alumni. Regents Science and Nature Center 1st animals: Miniature Donkeys and Goats. 20th Anniversary - 940 Students Grades K-12; 57 Graduates, 331 Alumni. 25th Anniversary - 1032 Students Grades K-12; 67 Graduates, 754 Alumni. Celebrating our legacy which helps build our future. The crest within Regents Traditional Seal is the symbollic heart of the school. It contains a set of images that represent key elements of Regents' values, traditions, and aspirations. The crest has four quadrants divided by a cross, with each quadrant identifying a unique aspect of Christian life. Veritas (Truth): The Bible and the lamp symbolizes truth which lies in scripture. In John 8:32, Jesus says that true disciples abide in His Word, and that "you will know the truth, and the truth will set you free." Reverentia (Reverence): The hands folded and raised in prayer portray reverence, awe, and adoration. As we behold the majesty of God, our response is worship, love, and devotion. Ministerium (Ministry): The hands extending the basket of loaves and fishes depicts ministry or service. Our worship, love and devotion to God are completed as are evidenced in our words and deeds. Fiducia (Faith/Trust): The anchor in the midst of turbulent waters represent faith and trust. This faith is the act of trust by which our hearts and minds embrace, believe, and personally rest upon Christ for salvation.